In a statement to RealClearPolitics, the 2008 vice presidential nominee predicted that her preferred candidate in the race -- long-shot GOP contender Rob Maness -- will pull off a major surprise on Election Day. According to the latest RealClearPolitics average of polls, Maness (9 percent) is trailing far behind Landrieu (38 percent) and Cassidy (33.8 percent) in Louisiana’s “jungle primary” system, in which all candidates appear on the same general election ballot, regardless of party. If no candidate receives 50 percent of the vote on Tuesday -- a scenario that appears likely -- the top two finishers will square off in a Dec. 6 runoff. 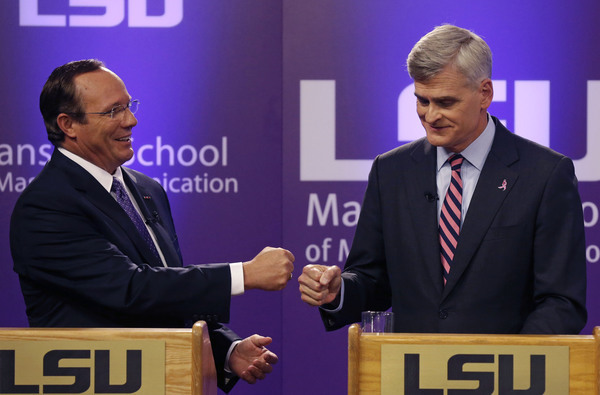 In a two-person race, Cassidy is widely viewed as the frontrunner and would be favored in a run-off against Landrieu. But Maness, a retired Air Force colonel, has generated some enthusiasm within the GOP grassroots and has won endorsements from several prominent conservative media figures, including Palin, Mark Levin, and Glenn Beck. Maness has also received the financial backing of the Senate Conservatives Fund -- a super PAC founded by former South Carolina Sen. Jim DeMint. The media bought into the false premise that this is a typical partisan establishment tiff between go-along-to-get-along politicians, Landrieu and Cassidy, and they're missing the boat. Like that Louisiana alligator who can dominate the swamp, Maness is ready to be on top of D.C.'s food chain and devour the crony capitalism that runs wild in government. Status quo politicians like Landrieu had their chance to clean it up, but the establishment has partaken of the grub far too long, and voters know this. The GOP machine should never have broken promises. They got involved in an open Republican primary because they don't respect the wisdom of the people. They chose their guy, and now as they work against the Maness momentum they're scurrying around with desperate lies in an attempt to swallow him up. Polls show the "expert" Washington consultants bet on the wrong horse. Their anointed candidate has a long record of liberal votes, many of those votes were quite recent. A survey I saw reveals Cassidy voted with Obama on 35 key votes, and he's even voted for Sen. Landrieu, and dissed Ronald Reagan! Look, it's most telling that the political machine's deputized one won't even show up at debates to defend his record. No wonder he's slithering down in the polls and this race is slipping away from the GOP. It's because Louisiana voters know they deserve better than Cassidy's M.O. I've been to Louisiana and seen the momentum -- Col. Maness is the only conservative in the race and the clearest contrast and strongest pick to take on Mary Landrieu. His real life record of service, work ethic, positive policy ideas and commonsense resonates with voters. Here he's fighting two powerful forces -- two consummate politicians and both parties' establishments -- yet he's the one showing real strength and keeping it positive. He'll prevail because he's fought and won tougher real life battles. The momentum IS on Col. Maness' side. The Louisiana primary system is the freest in the country and the GOP oppresses that freedom by working against him with false scare tactics and calling this good man a "spoiler" or "vote splitter," and their attempts to shoot him down are backfiring. Louisianans are realizing there is little difference in voting for the two politicians in this race, and they're looking to make their vote count and actually make a difference. They're seeing they have the choice to send Washington a message, and that's why I'm confident Louisiana will be the epicenter of a political earthquake on Tuesday with their vote for Rob Maness.